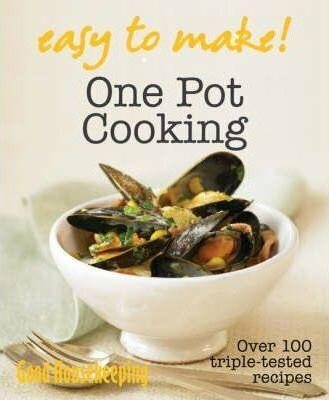 If you find that endless scrubbing of grimy pots and pans takes all the joy out of cooking, then this is the book for you - every one of its 70 mouth-watering recipes can be cooked in one pot from start to finish. From a courgette and parmesan frittata to a bread and butter pudding, each is bound to delight those waging a war on washing up. Over 100 triple-tested recipes in a new full-colour cookery series, featuring the most popular recipes from the GH Institute Kitchens - tried, tested, trusted recipes that are guaranteed to work first time every time. Other titles in the Easy to Make! series: `Everyday Family Meals' (9781843406464), 'Healthy Meals in Minutes' (9781843406495), `Cakes & Bakes' (9781843406419), `Soups' (9781843406426), `Wok & Stir Fry' (9781843406433), 'Meat-Free Meals' (9781843406440), 'Pies, Pies, Pies' (9781843406471), 'Puddings & Desserts' (9781843406488) and 'Roasts' (9781843406501).